A heavy duty frame tent, 5m long, 5.5m wide x 2.5m high with two openings. Suitable for use as an office, warehouse, field clinic, accommodation etc. Six persons are needed to transport the tent; three to erect it. Whenever possible, avoid erecting the tent under trees, (leaves lying on the material will lead to rotting). Impervious: no need for a double roof. Warning: Do not disinfect the tent with a chlorine solution. Chlorine will attack the cotton and weaken or perforate the tent. 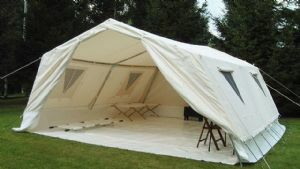 Make sure that the tent is totally dry and the set is complete before storing it away. NOTE: This tent was developed by MSF with several European manufacturers, in order to guarantee its quality. Do not buy locally produced copies.